Winnipeg | Reuters — Parched pastures and crops in Western Canada are driving up cattle-feeding costs, and farmers and analysts expect the changing economics to stem a recent stampede of U.S. cattle being brought over the border. Canada imported 65,035 head of cattle from the U.S. from January through June, nearly double the pace of a year earlier when imports of U.S. cattle were at their highest level in 16 years, according to Statistics Canada. Most were young cattle to be fattened on feedlots. 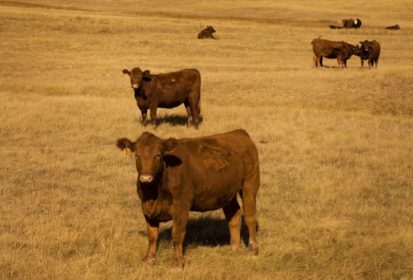 But dry Canadian conditions that have curtailed hay supplies are making it cheaper to fatten cattle in the U.S. A drop-off in the supply of Canadian cattle would amplify concerns for feedlots and packers in Canada, where the country’s herd has declined steadily. Canadian government data on cattle imports lags about two months, so a reduction in U.S. supplies may not be publicly reported until well into autumn. Rainfall in the past two months has fallen well below normal on the Canadian Prairies, with southern Alberta collecting less than 40 per cent of average amounts, according to the federal agriculture department. With limited supplies of feed grains in Western Canada, and a big U.S. corn crop on the way, it will soon make more sense to fatten cattle in the United States, said Rick Paskal, president of Van Raay Paskal Farms in southern Alberta. Charlie Christie, who runs a 400-cow ranch and feedlot near Trochu, Alta., said he expects dry conditions to curb numbers of U.S. cattle being moved to Canada and also cause more Canadian calves to be sent to the U.S.
An early surge of Canadian calves sold to feedlots this fall, as ranchers limit exposure to soaring feed costs, may leave supplies ample for now, said Brian Perillat, senior analyst at Canfax, a market analysis firm. Some ranchers are also culling their herds more than usual, putting more cattle on the market this year. But longer-term, the Canadian herd’s decline raises concerns about how to compete with the expanding U.S. numbers, Perillat said. Canada, the sixth-largest beef exporter, had 11 million head of beef cattle as of July 1, a number that fell for the 13th straight year, according to Statistics Canada. But Canada will likely slaughter the most cattle in eight years in 2018, Perillat said, as the larger numbers of U.S. imports work through the supply chain. A new plant, Harmony Beef, opened last year in Alberta, where Cargill and JBS operate larger plants. Montana and Wyoming feedlots face similar high feed costs due to dry weather as Canada, so more cattle may end up further south in Texas, Kansas and Nebraska, said John Ginzel, analyst at The Linn Group in Chicago. The U.S. cattle herd will this year reach nearly 133 million head, its largest level in 10 years, according to U.S. Department of Agriculture data. — Rod Nickel is a Reuters correspondent covering the agriculture and mining sectors from Winnipeg.